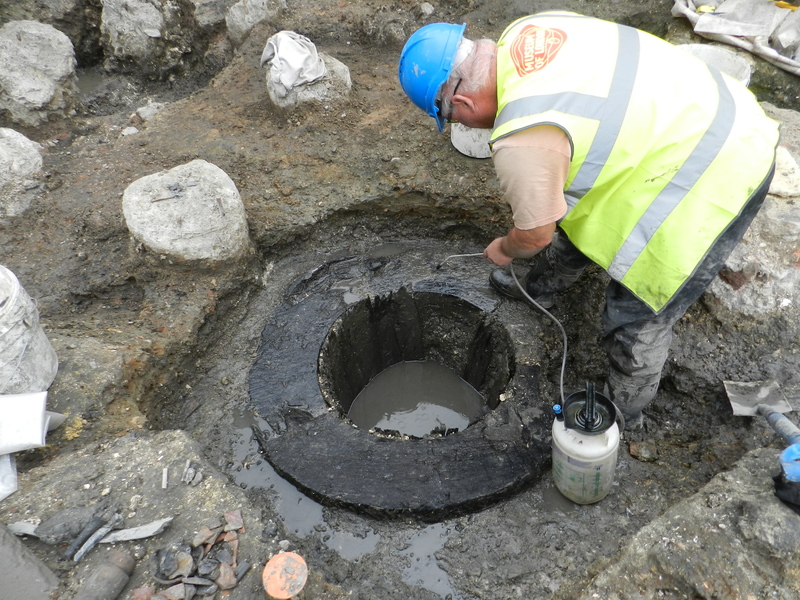 Being above a water source, sites along the Walbrook often feature a number of wells of various dates. All through history small wells (c. 1m across) would have been constructed as a source of water for individual or small groups of households. They would likely have used buckets on ropes to pull up the water. On one particular site at the moment we have 3 wells constructed in different ways, and at different times. The first is a chalk lined well, likely dating to the 18th century based on clay pipes retrieved from the silt inside the well. This was nicely constructed, with squared chalk blocks nicely faced on the inside. The chalk was 0.30m thick all around. The well was backfilled after use, and at the top of this well we found part of a small wooden bucket! A second well also had a chalk construction, but this appeared to be a later phase built above a wooden construction. The wooden well consisted of vertical planks pressed into the clay at the sides. 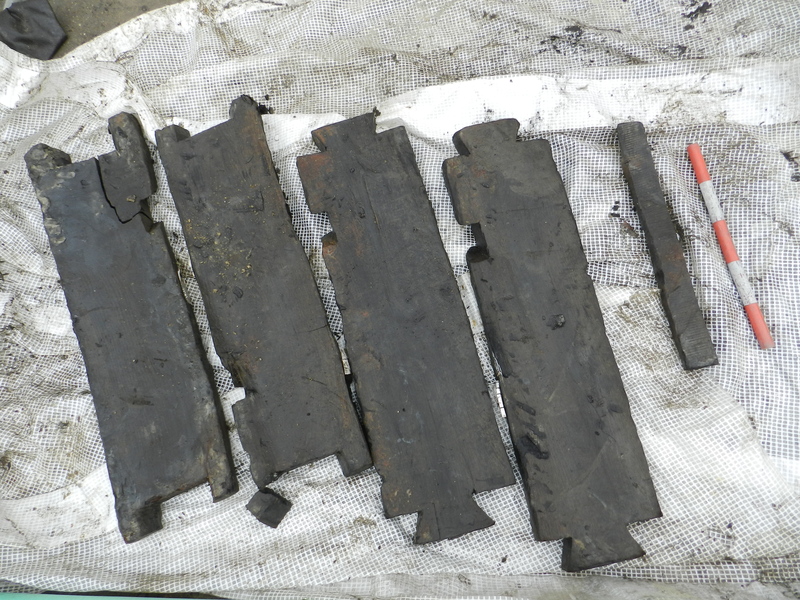 these planks were reused staves from a wooden barrel At the top of the well was a substantial circular wooden collar, made in 4 pieces and fixed together using dovetail joints. This is likely to date to the late medieval period, or early post medieval period, so perhaps 15th – 16th century based on the finds in the backfill…. Although I am sure when our timber expert has had a look at it a more definite date will be assigned! The final well is a timber lined Roman well, which also had a later chalk lining. This timber well was a box frame construction, with horizontal timber planks on the sides and cross beams in the corner to hold them in place. a number of these type of wells have been found in the Walbrook area. We have yet to reach the bottom, but it has already produced a number of Roman coins and metal finds from within the backfill.